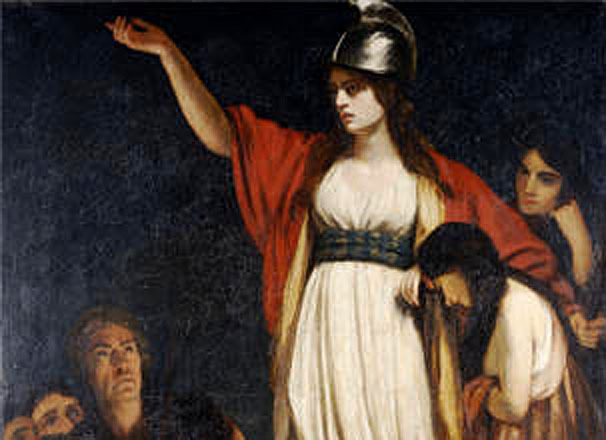 Home > Articles > Ancient > Why did Boudica lose? The final battle between the Roman legions and Queen Boudica’s rebel army in AD 60 or 61 (we are uncertain even of the precise date) determined the future of Britain for 350 years. Had the Romans been defeated, they would have had to mount a new invasion. They might well have chosen not to do so – leaving Britain outside the Roman Empire, as Ireland and Scotland were to be. The odds on a Roman victory did not look good on the day of the battle. When Boudica raised the banner of revolt in Norfolk, tens of thousands joined her, not only in her own tribal territory, but far beyond. The rebel army defeated a legion and destroyed three towns in succession, Colchester, London, and St Albans. Then, swollen to perhaps 80,000 or more, the rebel host moved north-westwards into the Midlands. The Roman army, in contrast, was reeling. The Ninth Legion had been defeated, losing heavily and falling back on its base. The Second Legion had been ordered to march to effect a junction with the forces under the direct command of the Roman military governor, Suetonius Paullinus, but its commander had refused (for reasons that are obscure) and it had remained at its base in the West Country. This left Paullinus perilously weak. Little wonder that he chose a strong defensive position for his little army as the rebel host approached. Tacitus says it was ‘a narrow defile blocked off at the rear by a wood’. Its purpose was to deny the rebels opportunity to use their vastly superior numbers to envelop and surround the Roman force: ‘he made sure that there were no enemy anywhere save to his front, where the ground was open and there was no risk of ambush’. Everything was to hinge on the frontal collision of two dense masses of armed men. So what do we know? Dio Cassius says that Paullinus deployed his army in ‘three divisions’, each ‘in close formation’ and ‘hard to break up’. Later, he appears to have these three divisions operating independently on the battlefield. We cannot make sense of this, since it does not conform to any known Roman military organisation, deployment, or manoeuvre. It may be a confused reference to the three elements identified by Tacitus when he describes Paullinus’ conventional deployment: legionaries in the centre, auxiliaries on either side, cavalry on the flanks. What follows appears to have been fast, violent, and decisive. The Britons advanced and were showered with Roman javelins. The whole of the Roman line – legionaries, auxiliaries, and cavalry – then charged. The legionaries attacked in wedge formation. The British line broke under the impact, but the escape route was blocked by the baggage-train, and the result was a massacre. Everything, it seemed, hinged on events which may have lasted only a few minutes, during which time javelins were thrown, swords drawn, the Romans charged, there was frantic close-quarters hacking and stabbing, and then panic spread down the British line as sections of it caved in. How long did it take? Five minutes? Ten minutes? The future of Britain for 350 years decided in minutes. Here we reach the heart of the matter. For what decided the outcome was the difference between the Roman legionary and the Celtic warrior in close-quarters action. The Celtic warrior was essentially an individualist. Prowess in battle meant seeking out opponents and duelling with them using a long, double-edged slashing sword. On the other hand, most Celts were relatively poor, and though most probably had helmet, shield, spear, and sword, very few had any body-armour. Chariots, horses, and chain-mail were restricted to the aristocratic elite. Rome, by contrast, was a centralised imperial state, whose professional army was committed to pitched battle, all-out war, and total subjugation of its enemies. The legionaries were highly drilled, heavily armoured, trained to fight as a team, and possessed of perhaps the best infantry weapons-system in the ancient world. It is most easily grasped by considering what Boudica’s men faced as they approached the Roman line.